Canada. 13th Scottish Light Dragoons. 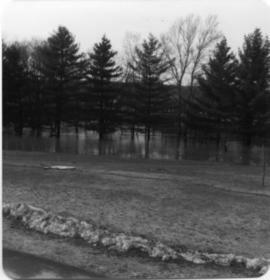 Landscape photograph of flooded field. 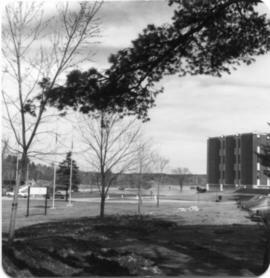 Photograph of Bishop's University campus. The item consists of a copy of a photograph of an elementary school trip group from Lennoxville High School from the 1960s. Pictured among those in the photograph are Nancy Baldwin, Karen Fidler, Timmy Crawford and Jane Fuller. The file consists of one invitation card to an informal dance from the Students Council of Lennoxville High School on 12 December 1935 at the Gymnasium. The file consists of one Public Notice dated 12 June 1913, posted by P. C. Duboyce, announcing an election for two school commissioners in the School Municipality of the Township of Cleveland, in Richmond County. The file contains primary source material on Gleason's Shorthand and Business College, located in Sherbrooke in 1913. It consists of a school catalogue, a list of graduates, their place of employment and a list of school fees. The item is an autograph book owned by Florence Mead (b. 1907) from 1923 containing signatures, personal notes, sketches, verses, poems, and course work from her time at Macdonald College School for Teachers. The item is a poem, titled "Vive Montjoie," composed by Dolor Biron in 1900 on the occasion of the annual trip taken by the philosophy students at the Séminaire de Sherbrooke. The item is a school workbook, creator unknown, containing student assignments in various subjects, including geography and religion, from 1854. The item is a postcard showing the Knowlton Academy (school) with children and teacher pictured working in a garden with rakes and hoes in the foreground around 1908. The photograph shows the students and teachers of Waterville Academy, probably taken in the 1880s. The photograph shows the students and teachers of Waterville Academy, probably taken in the 1890s. Item is a photograph of the home of Murdo and Joyce MacDonald, which was formerly the McLeod schoolhouse (built 1903), taken around 1956. Kathy McLeod is visible on the front lawn. The photograph shows a Grade X class of the Sherbrooke High School from 1961-1962. Pictured at centre is Royce Gale. The photograph shows the student cast of the "The Prince of Martinique" by the Sherbrooke High School in March 1950. The photograph shows the student cast of a "Coronation Revue" by Sherbrooke High School in March 1953. The photograph shows the student cast of "Creatures of Impulse" performed by the Sherbrooke High School in December 1951.